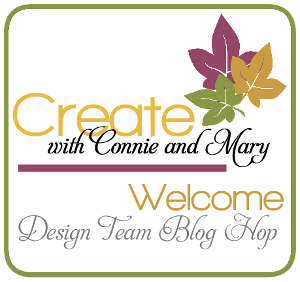 Welcome to the beginning of the Christmas inspiration of the Create with Connie and Mary Design Team Saturday Blog Hop. For quite a few weeks coming up, each Saturday the design team is going to have a different Christmas theme inspiration! 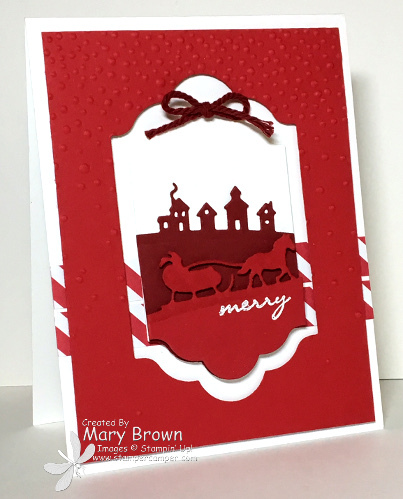 Our first challenge – make a red and white Christmas card! Real Red dsp Paper Stack – diagonal striped print – cut two 1/2 x 4 1/4, add to card base. Real Red – 3 7/8 x 5 1/8, cut out center using Lots of Labels framelit then run through the Softly Falling Embossing Folder. Add to card base using dimensionals. Whisper White – Cut out smaller Lots of Label framelit. Cut out Cherry Cobbler Houses Edgelit piece and Real Red Sleigh Ride Edglit piece. Layer together and fun through same framelit as the Whisper White piece. Add Cherry Cobbler piece directly on the label. Stamp ‘merry’ using Versamark on the sleigh one, white emboss then add to label with dimensionals. Add label inside frame using dimensionals. Tie Bow in Cherry Cobbler Thick Twine, add to top of label. So…overall pretty simple card. I did REALLY like playing with the edgelits…what FUN! AND…my card is red and white! This entry was posted in Christmas, Create with Connie and Mary, Holiday Mini and tagged Jingle All the Way. Bookmark the permalink. Thank you for the much needed inspiration Mary. I too, HAD to have those thinlits and I’ve yet to use them. I’m going to adapt your card (maybe with silver—hee hee) for my Tuesday class which I still need to prep. Hi Mary! Love this card. The hop was good but I see several others couldn’t stay away from the silver. Hooray to you for sticking with the challenge colors.